Workspace Admins can remove team members from the workspace. First click on Members, then under the Users tab, click on the gear icon next to the member you want to remove and select Remove from workspace. This action will remove the team member from the workspace you were in. What happens to the team member data once removed ? 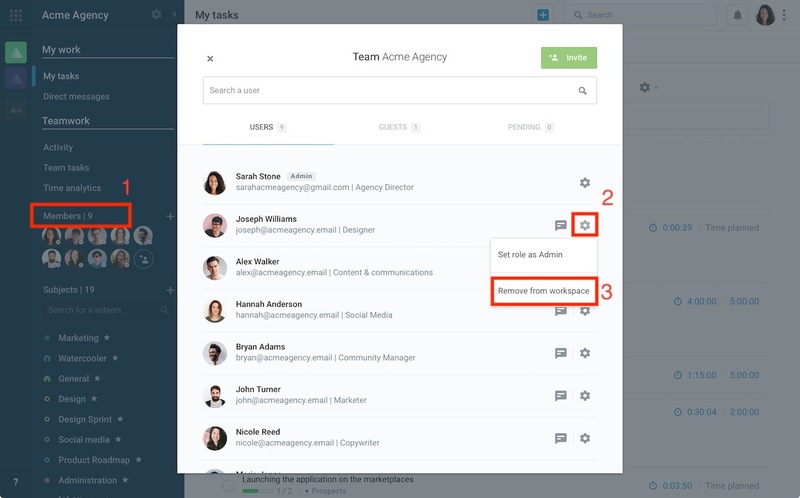 All of the tasks and conversations the team member contributed to before being removed will remain available on the workspace. This is also true for Time Tracking data. All of the subjects they were sole officer of are now without an officer. Subject members can become subject officer in the Subject members settings. The Direct message threads with the team member are still available to see past conversations, but no new messages can be posted.